Can Ireland become a global leader in Fintech? There is no doubt about it, Fintech is changing the way we do business. From crowdfunding to mobile payments it has never been easier for companies to raise funds, track payments and expand their business. Want to send money overseas or change your euros to dollars? Avoid unfavourable currency conversion rates charged by traditional banks and chose one of a number of start-ups specialising in international money transfers and currency exchange marketplaces respectively. Algorithms are now performing the functions of investment managers but are doing so at a fraction of the cost. Global investment in these and other fintech technologies has sky rocketed from $930 million back in 2008 to nearly $3 billion in 2013. That figure was above $12 billion last year. To share in this windfall, Ireland is aiming to position itself as a global hub for the development of, and investment in financial technology. It already has the necessary ingredients to make this a success: a thriving technology sector, a highly skilled, multi discipline workforce and a globally recognised international financial services sector with direct access to the European markets and strong ties to London and New York financial centres. Indeed Ireland has already built a global reputation in the payments sector due to the successes of Realex and Stripe. The next generation of Irish fintech firms are now hot on their trails. Currencyfair, the peer to peer money exchange platform has recently raised €10 million and is set to double its current staff in Dublin. Similarly, Tranfermate, a fintech company offering lower international transfer fees compared to those charged by banks has taken on 25 new staff over the course of 2015 in its Kilkenny base. Despite these successes, Ireland still has a lot to do before it can be considered a global hub for Fintech. 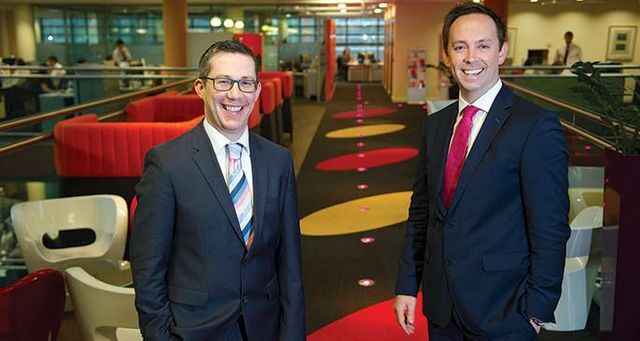 The below article, an interview with John Murphy and Brian Leonard from PwC published in the Sunday Business Post last month, touches on some the challenges which lay ahead. With a critical mass of firms located in London, New York and California, the Irish industry has plenty of tough competition. But PwC believes a Fintech hub is achievable if we play to our strengths, writes Leanna Byrne The Irish tech and financial industries have been hit by the Fintech fever. Small indigenous companies such as Realex and Currencyfair are cornering payments and foreign exchange business which were traditionally safeguarded by financial institutions, while companies like Fenergo and Britebill are helping larger firms to leverage the benefits which Fintech can bring.